Definition at line 27 of file CLabel.h. Definition at line 25 of file CLabel.cpp. Definition at line 31 of file CLabel.cpp. Definition at line 37 of file CLabel.cpp. Definition at line 62 of file CLabel.cpp. References C_FLOAT64, CLBoundingBox::getDimensions(), CLDimensions::getHeight(), CLDimensions::getWidth(), CLGraphicalObject::mBBox, and CLBoundingBox::setDimensions(). Definition at line 43 of file CLabel.h. Definition at line 44 of file CLabel.h. Since labels are not part of the model, we can't use the new method for getting the text but have to fall back to the old behavior. Hopefully I can get rid of this implementation sonner than later. Definition at line 80 of file CLabel.cpp. References CKeyFactory::get(), CCopasiRootContainer::getKeyFactory(), CCopasiObject::getObjectName(), CLTextGlyph::mIsTextSet, CLGraphicalObject::mModelObjectKey, and CLTextGlyph::mText. Definition at line 43 of file CLabel.cpp. 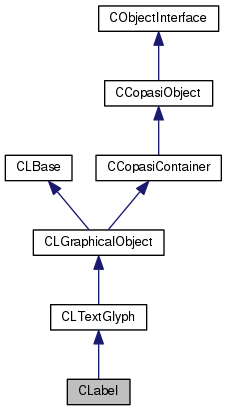 References CLGraphicalObject::getHeight(), CLGraphicalObject::getWidth(), CLGraphicalObject::getX(), CLGraphicalObject::getY(), orig_height, orig_width, orig_x, and orig_y. Definition at line 52 of file CLabel.cpp. References orig_height, orig_width, orig_x, orig_y, CLGraphicalObject::setHeight(), CLGraphicalObject::setWidth(), CLGraphicalObject::setX(), and CLGraphicalObject::setY(). Definition at line 69 of file CLabel.cpp. References CLBoundingBox::getPosition(), CLPoint::getX(), CLPoint::getY(), CLGraphicalObject::mBBox, CLPoint::setX(), and CLPoint::setY(). Definition at line 33 of file CLabel.h. Referenced by getOrigHeight(), initOrigValues(), and scale(). Definition at line 32 of file CLabel.h. Referenced by getOrigWidth(), initOrigValues(), and scale(). Definition at line 30 of file CLabel.h. Referenced by initOrigValues(), and scale(). Definition at line 31 of file CLabel.h.